I have been working like a Trojan all morning getting up old Bible notes for the examination that we are to have next week and I feeel so tired and musty, since I have not been out all day, that this letter, I am afraid, won't be very interesting or entertaining. You know, I never thought for a minute about my having to wait over Sunday if I spent the night in Baltimore. It never occurred to my that it would be that late in the week when I got there. I am worried to death about it because I don't see what I can do. I want to spend the night with you so bad, but don't see how I can stay over Sunday, do you? Unless I took an afternoon train on Sunday and got home Sunday night I don't see what I could do except go on Saturday afternoon. We will get to Baltimore about two o'clock and maybe it would be best for me to stay a few hours with you and then take a later afternoon train home. I simply don't know how to manage it. I don't see how I could only stop and see you for such a little while when I haven't seen you for so long! It isn't quite settled yet about our going on that late train from here, but I suppose we will, since the afternoon train would get us to Baltimore pretty late at night—about half past eleven or somewhere around there. But Commencement isn't over till one o'clock on Friday and so we simply couldn't start until that night unless we took the afternoon train. But I will tell you definitely when we leave, as soon as I know and then we can arrange But please tell me what you think I'd better do!Nothing has happened at all this week, except the little glimpse I had of Aunt Margaret, which certainly was nice. Did she stop and see you in Baltimore on her way up? I did wish so that she could have stayed a little longer because it is almost like seeing a piece of home when she comes. Just think! It is only a little over three weeks now before we go home! Isn't that the grandest thing! But I don't see how I can wait for those three weeks to go. I want to see everybody so much. I have been just so homesick the last few days. Our examinations begin the twenty third and I am simply petrified to a peanut. I know I am going to flunk them all! I do hope that you got through your chemistry & Economics alright, dearie. Our History exam is going to be in little sections—60 pages each—and as one of the little section tests comes to-morrow I have to stop in a few minutes and study for it. We are going out to-night to a play at the Babtist University for girls here in Raleigh. They are going to give “Twelfth Night”, and though I should think it would be rather beyond their powers and I suppose it will be entertaining anyway. Our elocution class is going to give “Midsummers nights dream” at Commencement and I am sure that is going to be good, as the girls that have the principal parts are good actors. The other day we had an earthquake, which turned out to be an old pipe, that had burst in the laundry machinery. It was the funniest thing. I was up in the Studio and the whole building just shook and there was the queerest rumbling noise. Everybody rushed out of Senior Hall that was nearest the laundry and everybody looked scared to death. We really thought it was a little earthquake at first. And when we found out what it was we nearly died laughing. All the negroes were so excited they were just jumping up & down. It is nearly time for the mail to go and I am will have to rush this. I am terribly afraid that it has gone already. Good-bye my darling, sweetest Detty. 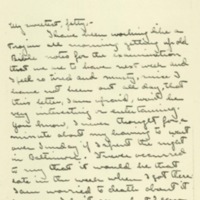 McAdoo, Eleanor Wilson, 1889-1967, “Eleanor Randolph Wilson McAdoo to Jessie Woodrow Wilson Sayre,” 1907 May 6, WWP17390, Jessie Wilson Sayre Correspondence, Woodrow Wilson Presidential Library & Museum, Staunton, Virginia.